Posted on July 18, 2016 by nathanlostlighthouse	in Gaming, Video Games and tagged Aerodactyl, Charmander, gaming, mobile gaming, Niantic, Nintendo, Pokémon Go, Pokémon gyms, Pokéstop, pokemon, social gaming, The Lost Lighthouse, TLL, tllgaming, video games. Unless you have been living under a Geodude for the last few weeks, you may have heard that Pokémon Go has been released across the majority of the world. The app has taken the world by storm, it is now one of the most downloaded apps in history and is currently on 10.8% of android devices. However, does the app live up to the hype? Hopefully this review will give you some clarity. The start of the game is similar to the Pokémon games of old. This time it is Professor Willow who offers you a choice of 3 Pokémon: Bulbasaur, Charmander and Squirtle. 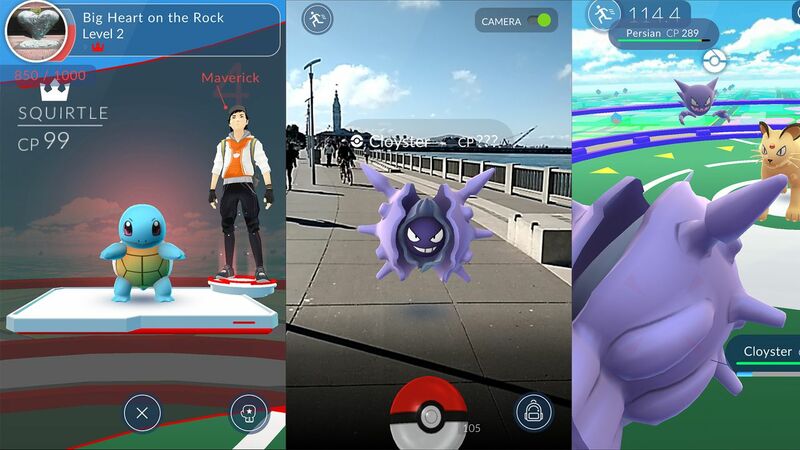 The 3 Pokémon appear on your mobile phone screen and you tap the one you want to start off with. There is a hidden Easter Egg where if you walk away from these 3, you can catch a Pikachu instead. I went for a Charmander in this scenario as I have always started with one. To catch him, your phone camera turns on and you can view the Pokémon via your screen. Levelling up Pokémon is done by either giving it a mixture of stardust and that Pokémon’s candy in order to increase it’s combat power, or giving it a load more candy to evolve it. Increasing combat power doesn’t give you experience, but evolving them does, so the key would be to evolve the weaker Pokémon and level up the stronger ones to make them stronger. Once you have a strong enough team, you can then head out and start taking down gyms. Before you do this, you have to choose a team to be on: Team Instinct, Team Mystic or Team Valor. There isn’t a benefit to choosing a certain team over another, so I chose Team Valor. Once you are at a gym, you can then battle your Pokémon. This is done by tapping the phone to use your Pokémon’s normal move to build up power for it’s special move. You can also swipe to dodge the rival Pokémon’s attack. If you win and take the gym down, you place your own Pokémon there to defend it. There also many features of the game which I thoroughly enjoy, mainly the egg hatching, as the only way to hatch eggs is by walking the distance that is needed to hatch them. There are 3 egg distances, 2km, 5km and 10km. The 2km ones are for fairly common Pokémon whereas the 10km are for the more rare kind. I have managed to hatch 2 5km eggs and 1 2km egg. The 5km eggs produced a Staryu and a Paras and the 2km egg produced a Magikarp. I don’t have a 10km at present, but it will be egg number 1 when I do get one. It also seems that location doesn’t restrict you to what type of Pokémon you can catch. I once caught a Goldeen in the middle of a field, with no rivers, lakes, sea or puddles around me. I suppose the best feature is how well the online community have responded in regards to the app. There are numerous pictures online of funny encounters with Pokémon, my personal favourite being one with a Magikarp in a frying pan. Twitter has gone mad with PokémonGo fans as well, lots of people sharing what they’ve caught, the hilarious names they’ve been given and the problems people have faced. It has also been noticed by the media too, there have been many horror stories related to PokémonGo. You may have seen the news story about the girl who stumbled across a dead body whilst searching for Pokémon. I really hope that doesn’t matter to me. My favourite story is the Pokémon Challenge issued by Twitter users. This is a series of challenges that trainers must to do to cross it off a checklist. There is no prize, only pride but the first challenge was to place a Pokélure (a lure for Pokémon to come to) at a hospital. I did wonder why until I realised what they were trying to accomplish. Unfortunately there are children who are ill and cannot leave hospital for days, maybe even weeks or months at a time. So the whole point of the lure was to bring Pokémon to the hospitals so they can continue playing. I was genuinely touched by this story and it was fantastic to see how well the online community has taken to this game. I did see a story recently where one user walked into an open road and got hit by a car. The girl blamed the app for this, however it clearly states that when the app is loading to be aware of your surroundings. There are of course some issues with game. The servers have gone down a fair bit since release which has angered the community. The excuse mainly being that the developers didn’t think it would be so popular. I’m sorry but this is a terrible excuse, people like me in their late 20’s have wanted to catch Pokémon in the real world since the games first came out on the original Gameboy. The servers are back up and running which is great, but you do wonder what is going to happen when other countries get hold of the app. Another issue is the battery life. Most smartphones use up a lot of battery anyway but this app is the ultimate battery drainer. You can turn on battery saver mode in the game and put your phone in stamina mode (Android users only) but it still drains. You will need to invest in a power bar if you plan on going on an adventure for a large amount of time. There are also some questionable Pokéstops and Gym locations. One stop nearby to me is the Royal Mail Sorting Office. I mean seriously, it is not a point of interest but if it does get me a few potions then I can let it slide. There are some Pokéstops in rough areas of the USA and teenagers are already getting their smartphones stolen by wandering into those area. There is also a Gym right outside someones house and he is getting very aggravated that people seem to be loitering outside. The biggest problem is crime caused by the game. There have been a lot of reports of trespassing on other peoples properties in order to catch rare Pokémon, as well as a lot of people using the app whilst driving to essentially drive-by stops, gyms and catch Pokémon. It is only a matter of time before we see a news article saying that someone has crashed their car trying to catch a Dratini or something and this needs to be taken into serious consideration. That being said, I have now been playing the game for almost a week and I have to say it is fantastic to be a Pokémon addict again. I have assembled a strong team and have started to dominate gyms around where I live, much to the annoyance of certain kids who have shouted at me to leave the gyms alone. I have also caught one of the rarest Pokémon in the game (Aerodactyl) and have evolved many other Pokémon in order to complete my Pokédex. The app, even though as a bit clunky to begin with, will forever go down as one of the most popular apps ever created, bringing together a fantastic online community. I have to say a massive congratulations to Niantic for creating such a fantastic app and for attempting to resolve server issues as quickly as possible. I will give the app 9 towns full of Rattatas out of 10. There are a few things that need sorting out still and features that need fixing. Server crashes happen quite a lot at the moment and this does need resolving as it’s not just me that is getting irate about it. That being said, this is something that can be resolved hopefully in the long run. Also this is the first 151 Pokémon available, there are still many more to be added into the game. I am loving this game and I’m sure that I will be continue to play for this many years to come. Posted on October 19, 2015 by nathanlostlighthouse	in Gaming, Video Games and tagged Android, augmented reality, games, gaming, iOS, Nintendo, Pokémon Go, pokemon, The Lost Lighthouse, TLL, tllgaming, video games. Nath is excited about Pokémon Go. Like, really excited guys. I have been a Pokémon fan for many years now. I watched the cartoons, saw the films, played nearly every game and collected the cards. Safe to say that Pokémon has made a lot of money out of me over the years, but I did think that it was somewhat lacking a little bit as with all the latest technology that was available, there was a distinct lack of a 3D port. There is a free-to-play one online I believe but still something that should be looked into. However, September 10 2015, a massive announcement was made, particularly for the fans of the franchise. Pokémon GO, a Pokémon game app on your smart phone that links to a Bluetooth device that sits on your wrist that uses real world location information to capture, battle, train and trade virtual Pokémon. This means you can be a real life Pokémon master. Words cannot describe how excited I am about this. The release is due in 2016 and will be available on iOS and Android devices (sorry windows phone users). Early notes say the app is free to purchase but there will be in-app purchases like most apps available. I haven’t found any details regarding the wristband as of yet, all I know is it will flash and vibrate if you run into a Pokémon in the real world. This is a massive benefit for myself as my job does take me all over the UK so hopefully I can explore most locations and hopefully capture a variety of Pokémon. No doubt I may have to start with a Rattatta or a Pidgey, but still Pidgey will eventually evolve, I never bother with Rattatta to be honest. I certainly don’t want to be running through forests to try and capture Beedrills, I hate bees. I believe this a fantastic move by Nintendo. To be honest they did say they wouldn’t enter the smartphone market, but this first move is absolutely fantastic. It also also means it will force children who play Pokémon to go outside whilst trying to find Pokémon. Maybe in the future they can set gyms up around the world or hold Pokémon tournaments like they do in the series in order to see who is the true Pokémon master. I would sign my name up for that in a heartbeat. However there could be some issues along the way. My first thoughts are how many Pokémon will they release into the world. My knowledge of Pokémon goes up to Platinum and that’s about it. I could think of a team consisting of anything within that range, but anything after I would be stuck. If the original 150 are released then I would be absolutely fine. Another problem is what are the in-app purchases? Pokéballs? Master Balls? Pokémon Centres? We will need more information, but I imagine this will come in time. Will there be a currency system used in the current games as well? Can you buy currency with real world money? I certainly hope not as the game will be flooded with money and would cause further problems. Also what about water Pokémon? My phone is waterproof but I don’t want to be searching for Gyarados in the middle of the Atlantic ocean. Also it rains a lot in the UK, will we just be inundated with water Pokémon and will my Charmander die in the rain? Aside from the potential issues, I do believe this is something we can get excited for. Being a real-world Pokémon master would be epic. I’m sure going outside has it’s benefits too. I imagine it may get a bit annoying though if I say I want to go to a beautiful part of the UK and then suddenly stop and say “OMFG there’s a rare Pokémon here, stop I have to battle it.” It won’t matter though, I will be the the very best that no one ever was.